For nearly two years, oil stocks were considered the worst-performing investments on the stock market. But the oil market has seen an astounding rebound in the last four months. From June 2014 to February 2016, the 78% crash in crude oil prices sent the S&P Global Oil Index – which follows 120 of the world's biggest oil companies – down 50%. That was significantly worse than the broader S&P 500's 7% drop over the period. Since February, however, the S&P Global Oil Index and WTI crude oil prices are up 23.6% and 83%, respectively. Prices sit near $46.40 today (Thursday, June 16). With oil prices having hovered in the mid-$40 range for the last two months, Money Morning Global Energy Strategist Dr. Kent Moors says prices have finally stabilized. In other words, they've already bottomed out and can only move higher from here. That's why we're going to show you one of the best-performing oil stocks of the year. While we project this company's stock price to keep rising from the ongoing oil rally, the firm also offers a massive 7.2% dividend yield. The average yield of the S&P 500 is only 2.1%. 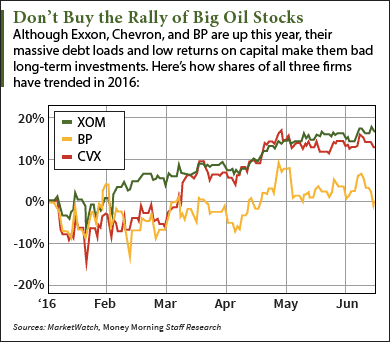 Several energy analysts and investment banks have recently recommended investing in Big Oil stocks. These are the world's eight largest oil companies and include heavyweights like Exxon Mobil Corp. (NYSE: XOM), Chevron Corp. (NYSE: CVX), and BP Plc. (NYSE ADR: BP). Analysts have been issuing "Buy" ratings on these stocks because they believe these oil firms are big enough to profit through any type of unstable oil environment. For instance, commodities research firm Argus upgraded Exxon Mobil stock to a "Buy" rating on May 18. Analysts give the XOM stock price a one-year target of $104 and believe the company's annual earnings will grow 70% in 2017. And earlier this week, French banking titan Société Générale S.A. issued a "Buy" recommendation on BP stock. What these analysts don't include in their investment reports is how the debt of Big Oil companies has increased tenfold over the last decade. Their return on capex projects has fallen from 22% to 7% over the same period due to the companies spending billions on projects that never yielded profits due to the recent oil price crash. In fact, Exxon's soaring debt levels pushed ratings agency Standard & Poor's to strip the company of its precious AAA credit rating back in April. "Avoid 'Big Oil' at all costs," Moors told Oil & Energy Investor readers. "Those aren't companies that are weathering a crisis – those are companies in the middle of a crisis." That's why Moors is keeping his eye on one particular oil stock. A great oil stock to consider is Genesis Energy LP (NYSE: GEL). Genesis is a Houston-based master limited partnership (MLP). These are companies that generate roughly 90% of their revenue from commodities like oil and gas. Midstream MLPs like Genesis connect producers with refiners by storing and transporting oil. Midstream MLPs have limited exposure to oil price volatility. Since they transport and store oil instead of owning it, they still make money as long as the oil keeps flowing. With U.S. production near a record high of 8.6 million barrels per day, oil is definitely flowing right now. That's why both Genesis and the broader MLP sector have been on a tear recently. While the benchmark Alerian MLP Index (AMZ) has surged 13% this quarter, GEL stock has soared 18.3% over the same period. "Midstream service providers are a company category I'm tracking for early indications of a bounce," Moors said in February when oil prices hit a 13-year low of $26 a barrel. "Namely selected master limited partnerships and related holdings of pipeline, terminal, and related assets." Analysts surveyed by Thomson Reuters give GEL stock a one-year price target of $41.25 – an 11% increase from yesterday's close of $37.20. While those gains may be a bit conservative, our dividend growth projections are anything but. Genesis currently offers an annual dividend of $2.69 per share and a yield of 7.2%. By taking its current yield and multiplying it by our stock price target, GEL's annual payout could grow to at least $2.97 in the next year. The Bottom Line: Oil prices have seen a confident rebound this year, but it doesn't mean you should go chasing after popular oil stocks. Despite what the analysts say, big-name companies like Exxon and Chevron have tons of debt and hardly any return on their drilling projects, making them bad long-term holdings. We recommend buying GEL stock due to its presence in the volatility-proof midstream sector and its generous dividend policy. Alex McGuire writes about oil stocks for Money Morning. Follow him on Twitter for the biggest oil and gas updates.